For an authentic glimpse of life in early Tombstone, Arizona, visiting the office of The Tombstone Epitaph is a must. Founded in 1880, it is the oldest continuously published newspaper in Arizona. The Epitaph office is located just off of Allen Street in the Town Too Tough To Die. The historic building now serves as a free museum showcasing presses, type set cases, printing equipment, and furnishings from an era dating back more than 125 years. Visitors can watch a free video on printing in the 1880s. Numerous exhibits and photographs chronicle the fascinating life of John Clum, the founder and original publisher of The Tombstone Epitaph. Best of all, for $3 you can purchase a copy of the Epitaph’s coverage of the famous shootout at the O.K. Corral and its aftermath. The gunfight involving Wyatt Earp, his brothers, Doc Holliday, and their cowboy adversaries was reported in detail over several issues of the paper. Reprints of these newspapers are available for purchase. The reading is riveting! 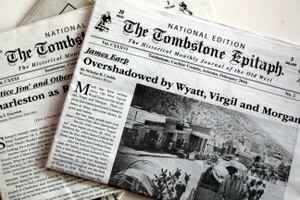 If you are a history buff or just love tales of the Old West, you can subscribe to The Tombstone Epitaph National Edition today. This monthly journal is filled with in-depth stories about the Old West’s outlaws, Indians, miners, cowboys, lawmen, and settlers. The free museum is open daily from 9:30 a.m. to 5:00 p.m. It is located on Fifth Street between Allen and Fremont. For more information, call 520-457-2211 or go to www.tombstoneepitaph.com.